Ashley Scribner - After graduating from Xavier University with a BA in Art, Ashley taught elementary art and pursued her art career in Cincinnati. A move to New York City, the center of the art world, sparked a new energy into Ashley's art and caused her to develop an affinity for the urban lifestyle. Ashley dove head first into living in the "City That Never Sleeps." She worked, painted and studiously learned the NYC subway system. While studying a subway map, Ashley realized it would serve as an eye catching canvas, and with the Brooklyn Bridge just around the corner from her apartment, she was inspired to turn the iconic image into art, painting it on top of the subway map canvas. 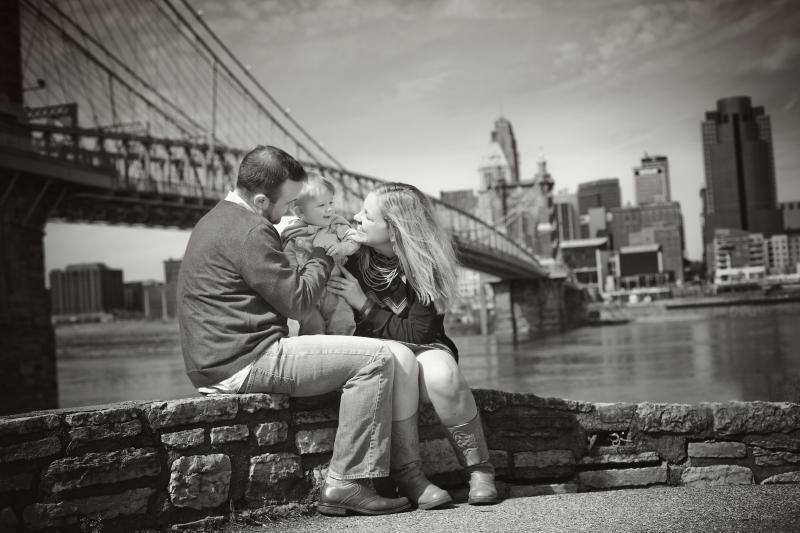 Ashley returned home to Cincinnati and brought her new love of city life and bridges back with her. Ashley sees Cincinnati in a new way and can't stop painting Queen City landmarks. The Roebling Bridge is now her main subject, but she also paints the Tyler Davidson Fountain, River boats, Union Terminal and even pigs! 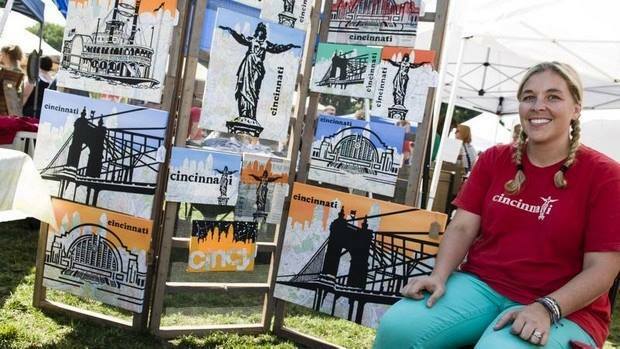 Her map canvasses have evolved to also include newspapers, and Ashley paints with bright colors to symbolize Cincinnati's current urban revival. On commission Ashley has also created iconic city paintings of Boston,Chicago,KansasCity,Rome,Cleveland,Columbus and Louisville. Although Ashley's city work is her primary focus, she does a variety of work on commission. She recently just drew her 100th custom cartoon, and dabbles in all kind of stuff all the time. Ashley has also just illustrated her first children's book: Findlay: A Cincinnati Pig Tale. After graduating from Xavier University with a BA in Art, Ashley taught elementary art and pursued her art career in Cincinnati. A move to New York City, the center of the art world, sparked a new energy into Ashley's art and caused her to develop an affinity for the urban lifestyle. Ashley dove head first into living in the "City That Never Sleeps." She worked, painted and studiously learned the NYC subway system. While studying a subway map, Ashley realized it would serve as an eye catching canvas, and with the Brooklyn Bridge just around the corner from her apartment, she was inspired to turn the iconic image into art, painting it on top of the subway map canvas. Ashley returned home to Cincinnati and brought her new love of city life and bridges back with her. Ashley sees Cincinnati in a new way and can't stop painting Queen City landmarks. The Roebling Bridge is now her main subject, but she also paints the Tyler Davidson Fountain, River boats, Union Terminal and even pigs! Her map canvasses have evolved to also include newspapers, and Ashley paints with bright colors to symbolize Cincinnati's current urban revival. Although Ashley's city work is her primary focus, she does a variety of work on commission. She recently just drew her 100th custom cartoon, and dabbles in all kind of stuff all the time. Ashley has also just illustrated her first children's book: Findlay: A Cincinnati Pig Tale. Please contact me at scribneram@yahoo.com if you are interested in any kind of artwork.